I am truly addicted to quilting. I’ve had so much fun making fun things, here are a couple of my favorites. A cute camera strap for my camera, which was really easy to make and I’ll put a tutorial on if anybody wants it. And a table runner that I absolutely adore, but I sold, because it was the third I made and how many table runners do I actually need? I even made a quilt the past couple of weeks which I LOVE the fabrics in, and I’ll take a picture of it after its quilted. So if I don’t answer the phone, and you don’t see me come out of the house for awhile, you’ll know i’m probably quilting. Camera strap tutorial: I unpicked the strap ends from my ugly Canon camera strap with my stitch ripper or a pair of scissors. You can either start with one single piece of fabric or piece different fabrics together like I did, either one, the fabric for the strap will be 24″long by 4″ wide. I interfaced the fabric with fusible fleece (I like Pellon brand you can get at Joann fabrics) You iron on the interfacing, cut off the extra, then sew right sides together the length of your fabric with a 1/4″ seam. Turn inside out, which is really hard since the interfacing makes it really thick but it will turn inside out eventually! 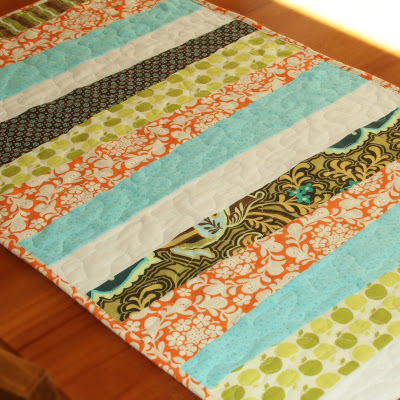 Iron flat, I quilted stitches down the length every 1/4″ but you don’t have too. Then just slide into the black vinyl pieces you removed from the old strap and stitch in the new one with black thread, and there you have it easy as pie, a new camera strap. 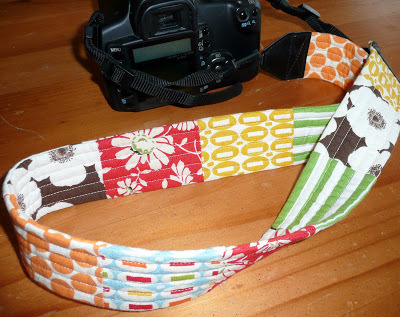 You could do this with a small camera strap too, or keychains, endless possibilities! thanks for the camera strap idea!!!!! i can’t wait to try it out. I'm going to get to this one of these days. 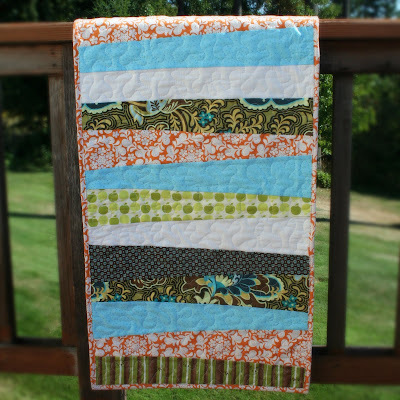 I love your ideas…and I would love a tutorial on that aqua quilt…. your work is beautiful!